So I return to the place that inspired me to pursue my passion for drawing. It's tempting to say that my new role at Pratt is no longer on the receiving end. But anyone who teaches well, knows that not to be true. It's an inspiring give and take exchange of ideas. If it were not for the monumental artists (perhaps more importantly - extraordinary human beings) like Jos A. Smith and James Grashow, I would surely have taken another path. BIG shoes to fill. Wish me luck in my efforts to make a difference in the new crop of artist hopefuls. Both of these guys look like rockstars! I taught there yesterday for the first time. Small class but cool campus. I have high hopes. The frustration was word that the Provost is losing his taste for the illustration department and needs convincing. Made me wonder why I stepped onto the ship. They need former grads to come forward, especially ADs and offer testaments to the importance of the department and the viability of Illustration as a career. Oh, lucky students to have you to guide and instruct them, dave! I wish I could sit in on the class and get me some learnin', too! You look just gorgeous in both your pics...I went "Whoa!" out loud when I saw them! I know it probably sounds silly, but I thought you look so much like YOU! Cool pix Dave...at least in your ID, you look cool. I would never post mine. Good luck with the classes! Tim: Congrats at Pratt. I heard the same thing going down at Parsons about the possibility of nixing the illo department. David, Back when I was a student at Zurich Kunstgewerbe Schule, nobody wanted to teach drawing anymore.I would take night classes and go the extra mile to find teachers. My class mates for graphic design created all their ideas with copy machines and told me I was nuts, for doing sketches. It's great that You step up to the plate and pass the torch. Pratt got the right man. Congratulations. wonderul, david! it is SO important that schools be staffed by teachers who were/are working profesionals who have in-the-trenches experiences and insight into the business. man, i love to teach -- i just wish i could find the time to do it more often. best of luck! fagetaboutit! Your going to be an awesome teacher . . . I bet challenging and an inspiration. Interesting . . . Fine Art Dept. I like the sound of a hybrid form. I actually am one of those that believe art must have content; beyond the visual impression. I did my thesis on the ashcan school. The important thing about them, for me, was that the 4 founding members were all illustrators and I think that helped them put purpose and content into there work. Anyway good luck, sounds like your going to have an awesome class. Will you show them you model drawings? Best of luck on the teaching gig David. I'm impressed with your commitment to make that long commute. David: Teaching has taught me a very valuable lesson: it's harder than it seems. Fifteen students means fifteen different ways of reacting to each idea you send out. I've learned to be as clear as I can be about the points I want to make, but then to be prepared to go through it all again at 33 1/3 for those who need it (which is almost everybody). I think I'm more patient now, less likely to get frustrated and pissed off. Everybody has their own horsepower, destination and speed limit. It's my job to pump the gas, shout encouragement and true things from the side of the road. I had to learn that the hard way (as usual). Good luck! David, I taught for two years at Mass College of Art. When asked to stay on I preferred to get back to my own work. One thing I took away from that experience: a lot of teaching is about a popularity contest. And administrations now regard pupils as "customers", or "clients." Cut through that bull, and you'll devolop some wonderful relationships and be amazed at just how phenomenally gifted, energetic and sweet some students are. That's my angle on it. Break a leg, man! Hey, you're not looking too much worse for the wear! Keep smilin', like a love chylde! It would be neat to have something of a journal from you and Tim. I'm sure we all have something to learn form you. David, Congratulations on your daughter's milestone and your commitment to teaching. I've taught down here at MICA a few semesters as adjunct and it is indeed challenging. Whitney Sherman has built quite a great illustration department here. I know what you mean by toast, took me a day to recuperate after each class. I may try again next year, not sure I have the patience or teachers vocabulary. Makes me want to go back to school! Gothard teaching, cool! David, congratulations, it must be such a blast to return to teach at your old school. Enjoy. Dunno what to make of those ID cards, but they are interesting to compare. I hope you have a good time with the instruction, I'm sure your students will benefit. I read a book about teaching I found particularly inspirational called, "The Art of Teaching" by Gilbert Highet. It's a pre-tech tome, but covers the subject of pedagogy in a very compelling fashion. I try to read it every couple of years or so to maintain focus. Also, great deal with your daughter's early admission. Her adventure begins indeed! Dave, why do you look better rested in your student I.D. than in your faculty card? Didn't we work you hard enough? Pratt is indeed lucky to have you at the helm of your classes. And just between me and all the drawgers, your students already have created enough good buzz that the chairperson of the Fine Arts Department has thanked me for bringing you on board. Now we have to work on Edel (another Fine Arts alum, folks). Do you think he still has his I.D.? 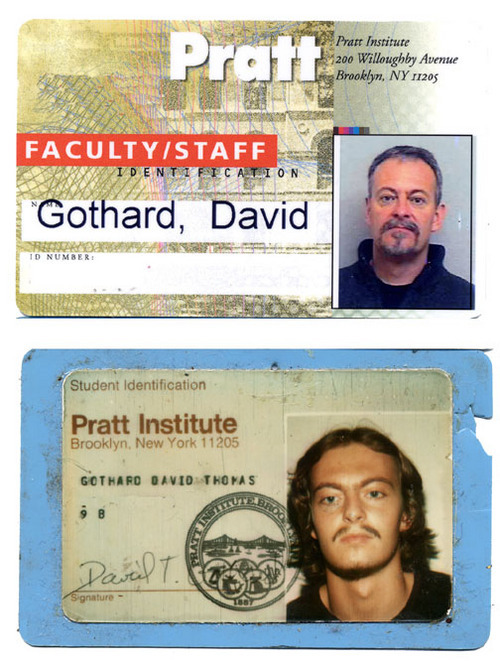 I have long since misplaced mine, but I do have a pile of faculty cards that show an accelerating rate of pre-mortem decomposition.